Fujifilm Sonosite has obtained 510(k) approval from the US Food and Drug Administration (FDA) for its new medical visualization solution, iViz. In September this year, the firm received CE mark approval for iViz, a platform that integrates ultrasound with medical IT. It was designed for clinical users, ranging from hospital settings to clinics in remote villages, to carry out ultrasound when and where it is needed. The new solution allows clinicians to access learning resources and patient information, store exam findings, submit reports and consult with remote providers for near real-time assessment. Fujifilm Sonosite president and CEO Masayuki Higuchi said: "iViz is a revolutionary solution for clinicians and represents a landmark in Fujifilm SonoSite’s innovation. "It achieves new levels of image performance and provides unprecedented connectivity in a highly mobile platform." iViz is claimed to be the first medical visualization solution, which is enabled for bi-directional EMR connectivity through the Synapse VNA. The platform will include web-browsing, email and ECG capability, based on the flexible Android OS. It can also send patient reports to the EMR, with few taps. iViz’s seven-inch display touchscreen, wide dynamic range, vibrant color flow images, imaging modes and exams will allow different medical providers to meet their clinical needs. 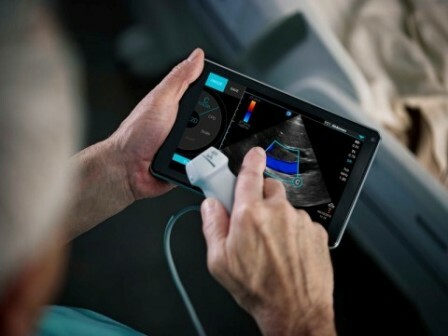 Image: iViz is a portable ultrasound augmented with mobile computing and advanced connectivity. Photo: courtesy of Business Wire.